Everyone wants to tell you they're "the Uber of something" these days. (Seriously. I put that phrase into Google and got back results ranging from "the Uber of funerals" to "the Uber of local trucking." If I believed in emojis in blog posts, there'd be an eye-roll one here.) It's a quick and easy one-liner to describe your new business idea in a trendy way. Preston Attebery, founder of DesignCue. Preston Attebery, however, is fascinated more with what this says about the emerging on-demand economy, and less with using it for a cheap tagline for his company. "I'm really interested in how work is changing, and startups are being 'born global,' " Preston says. "I saw an article about, basically, the 'Uber for taxes,' and it was a shockingly seamless experience to be connected to a CPA, chat through an app, and have an entire professional conversation without spending a lot of money or time on email back-and-forth." 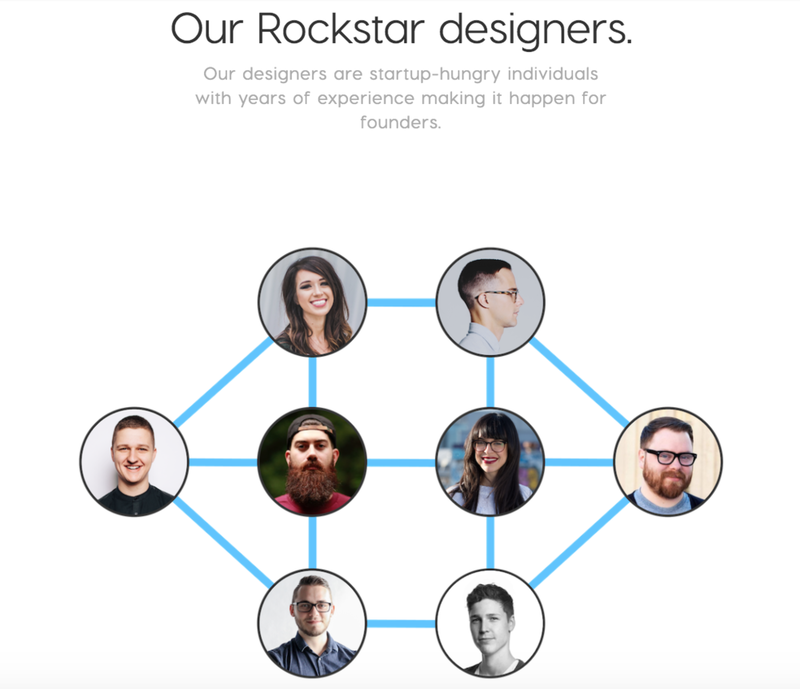 If you're a founder, DesignCue is where you go to to "hire designers to hustle for your startup." You get access to high-quality, professional designers with experience at Google, Lyft and more. How it works: Visit the Website; submit a brief for mobile, app or Web design; pay to reserve your design team; partner with your project manager and designer to create your vision; and within (typically) seven days, you'll get a first draft concept. Nitpicky about your design? Not to worry, there's some revision time built into the process, and DesignCue offers a satisfaction guarantee and promises that "if it's not perfect, we'll iterate until it is." Preston says the ideal DesignCue client is a team of fewer than 15 employees with a forward-thinking founder — "someone who appreciates design, can articulate desires, and trusts DesignCue as a partner." They want to solve some of the major pain points for getting design services, both on the design and on the consumer side. For founders, finding talent and accessing it in a streamlined way can be difficult, with communication gaps and long turnaround times. For designers, inefficiencies throughout the process can cause delays and frustrations. DesignCue aims to dig into the process itself and find the best way for quality design in a reasonable amount of time for a reasonable cost, while also saving designers time "to spend obsessing over the details instead of the basics." DesignCue's experienced designers are waiting to make your design dreams come true! This approach appears to be working, as in the first eight months the company has hired a total of nine designers, with about six designers working consistently on client projects, and has received ongoing referrals from clients, including one who shared DesignCue with the Y Combinator network. Preston says he hopes to grow the revenue to $250K in the upcoming year. The company also recently relaunched its site, changing its concept and approach a bit. Preston says his friends told him the original site just didn't "sound" like him. "After doing months of research, I lost my own voice to a vague replication of the companies I admired," Preston says. "It’s definitely okay to emulate other companies, but eventually you need to circle back and speak your own words with your own tone." "The hardest part of launching is deciding what to ship. There are so many options, and for me, early on, it was difficult to narrow down exactly what DesignCue is, and what it should provide. The best part of launching was getting the wheels turning. Launch is scary, but it shouldn’t be your focus. Building is the hard part!" As a fellow "research everything" aficionado, I of course wanted to know what worked for him. Preston mentioned the Basecamp and Intercom podcasts, as well as Basecamp founder Jason Fried’s books, “Remote” and “Rework,” and design works such as “Keep it Simple” by Hartmut Esslinger and “Dieter Rams: As Little Design as Possible." And, of course, he leans on his girlfriend and fellow Switchyards members, including Ugo Ezeamuzie of Bloveit, for challenges and thoughtful feedback. Preston says the support of his friends and family has been key to taking this step with DesignCue. In addition to an inspirational role model in his uncle, who sold his portfolio of car dealerships in England for over $100 million, Preston also has some down-to-earth models as well: His mother never went to college but is now a vice president of marketing at BB&T insurance, while his farther started his own landscaping business and involved Preston and his brother. "It taught me to value hard work ... and that I don’t like landscaping," Preston says. "Design is much more fun." He also believes in designing using common sense, and relying on others' honest feedback. "I just put it out in the world and see if it works," Preston says. "Sometimes, the only way to know something is right is letting real, unprompted users get ahold of your product." Don’t buy into the startup rush. You don’t have to reach $1B in valuation in three years. You aren’t Slack, and they started ahead. Don’t buy into investment as the only way. Money comes easy when you’re growing rapidly, but it comes with a multitude of strings. To stay in control of your business, to stay stable, build all that you can using your own money. Don’t wait on cofounders. If you can’t find a cofounder to join you, don’t wait around. Who’s to say you can't be successful alone? Build what you can and hire later. Don’t spend money on design or dev until you need it. Overbuilding and overspending on design is a trap many founders step into. What’s the use of spending $50k on a brand design only to launch your app and no one uses it? Same goes for developing. Validate before you spend big on design and dev. You’ll always have time to make your tech and design better once you have cash. See Airbnb and Uber."